The special child in your life can dress up their favorite fashion dolls with flair and flare with this circle vest. The circular construction and increases make it flare and ruffle in the back which gives it shape. It can be worn as shown or upside down to make it a cropped vest, and it can be worn open or closed with a fastener of your choice. 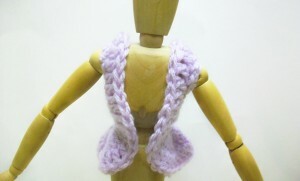 This entry was posted on Tuesday, April 3rd, 2012 at 12:00 AM by Candace	and is filed under Free Crochet Patterns. You can follow any responses to this entry through the RSS 2.0 feed. You can skip to the end and leave a response. Pinging is currently not allowed. I love the idea of the vest, but how would I upsize it for an 18-inch doll? You would need to make more rounds before the armholes, then continue from there, making sure the armholes are big enough and spaced properly. Hi, Im confused at the part that says “skip 3 hdc, 6 fdc,….” does that mean when i skip 3 ch, i crochet 6 fdc unattached? I think the step after that is ” one LDC into next st. So do i put the ldc into the 4ch or 9th ch? Yes, the 6 fdc are detached to create the armholes. The ldc goes in the next st after the skipped ones.